The first newspaper I read as a boy was The Renaissance published in Enugu. I later learned it was once known as the Biafran Sun. And while I continued to read my favourite title every day a copy was delivered to our home, it was renamed Daily Star. A vernacular title called Ogene soon followed. Today, however, you can hardly find any paper that resembles Ogene. As I now wonder what has happened to the “Jews” of Africa, I remember that the tonic Ndigbo needed is in the title of the first newspaper I read in the early 1970s. Together with their kith and kin of the south-south, Ndigbo have taken a stand this year through their votes. But there’s still a problem. Where would an outsider find the Igbo leader today? Not any of the five state governors. Not a senator. Not a first-class chief. Not even an elder statesman of Igbo extraction. But it’s not totally true that Ndigbo know no king. Although there were fewer human kings in the days of yore, there were masquerades, speaking in their guttural voices, in Igbo-land to provide leadership. Several generations of Igbo people will forever remain grateful to Chinua Achebe for telling the story of pre-colonial Igbo-land through Things Fall Apart. As he shows in the evergreen novel, the masquerades in Igbo-land – egwugwu or mmanwu – are regarded as the ancestors from beyond whose advice cannot be ignored. Their voices are unlike human voices, but they speak the truth at all times. Perhaps it’s because masquerades have been abandoned that Ndigbo now act and talk individually. Were it in the good old days, egwugwu would, for instance, have been able to state the position of Ndigbo in the current affairs of the country. However, how the dead ancestors transform to egwugwu is what I don’t know and cannot describe today! I’ve heard leaders of other parts of the country say they seek “a handshake across the Niger” but don’t know Igbo leaders with whom they can strike a deal. Of course, they can’t converse with weird masquerades! With traditional religionists vanishing in Igbo-land, the custodians of eternal wisdom (mmanwu) are hardly heard these days. Even the Igbo language is facing extinction due to the foolishness of the “modern” Ndigbo. Ohanaeze Ndigbo comes closest to what could be regarded as the Igbo leadership today. 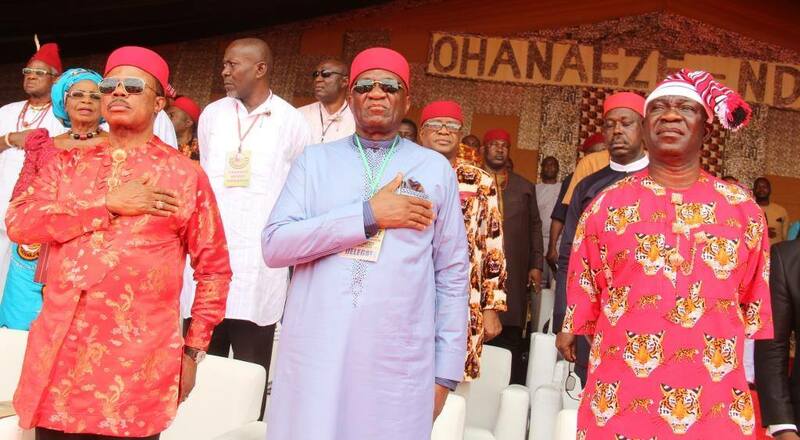 The socio-cultural group now led by Chief Nnia Nwodo has left no one in doubt about Ndigbo’s determination to take their rightful place in Nigeria and in the world. Nnamdi Kanu is perhaps the next most influential after Ohanaeze. Touch Kanu and you face opprobrium from millions of youngsters! What do the Igbo want in 2023? It’s RESTRUCTURING or nothing, because Nigeria’s unbalanced “federalism” is hurting them the most. For there is no pretending that Ndigbo are still bearing a cross in Nigeria. Appointments made at the federal level in the past four years have cleared all doubts! Now it’s no longer the Igbo alone that complain about the imbalance in the leadership of the nation’s security, judiciary, legislature and executive. Away from government, an Igbo employee has to be 200% better than a non-Igbo to be considered half as good. Luckily for the Igbo, many are self-employed as traders and technocrats. That’s why they hardly get to the top except where they’re indispensable. The unwritten rule seems to be: “Let them be hewers of timber and drawers of water while we help ourselves to the treasury.” Whenever there is a crisis in any part of the country, Igbo people and their shops are the first to be attacked. For no just cause. Just envy. The Igbo masquerade would tell you that rotation of political offices is older than Nigeria, at least in the Igbo area – it was not started by the NPN of the Second Republic as many have erroneously stated. Right from the earliest times, monarchies were not permitted in Igbo communities (except in Onitsha, though the people of “Onitsha Ado” trace their ancestry to the old Bini empire). There can be no better explanation for Ndigbo’s republicanism than their love for rotation of leadership positions. Even if all other parts of Nigeria are against rotation, Ndigbo should not be. Rotation (or what “special” linguists now call “zoning”) is not democratic, but Nigeria has not grown above it. The current hullabaloo would have been avoided if visionary people had led Nigeria. It was Alex Ekwueme that actually divided Nigeria into six geopolitical zones. The 1995 constitutional conference supported him and agreed that the presidency should be rotated among the zones for 30 years (that is, one term of five years each) in order to achieve national unity and stability. One “Nigerian factor” has been that nobody has cared to prosecute Abdulsalami Abubakar and his military goons that, after Abacha’s death, threw away the recommendations of the 1995 conference and, instead, gave us a fraudulent constitution. Imagine the billions that were wasted on that conference and the billions that have been wasted on the review of the 1999 Constitution since 2001. By the way, where is the sixth Igbo state recommended by the conferees of 2005 and 2014? Maybe that has entered voicemail too. Ndigbo know it should be their turn to produce the president in 2023 but they’re not enthusiastic about it. Political offices are relatively inconsequential. Even then, their undoing has been that any position reserved for them gets contested by scores or even hundreds. Everyone feels he’s the most qualified. Egoism – it’s wrong. When the Igbo rally round a leader, once again, it will be the beginning of their renaissance. I’m no chauvinist. Far from it. But, like most Igbo, I’m a realist — realists say things the way they see them. Come to think of it, is tribalism not a huge problem in Nigeria? Why do some people bury their head in the sand like an ostrich whenever ethnicity is mentioned, yet they drink, eat and bathe with ethnicity every day? If preaching oneness is the solution to the problem, why have we not been united all these decades? Even the Nigerian constitution devotes several clauses and sub-sections to the “Federal Character Principle” and the like, yet all the people who have ruled and ruined Nigeria did so by practising tribalism of the crudest kind. All the talk about “zoning” or rotation of offices is nothing more than tribalism. Everyone has the right to express their feelings on any subject. So I don’t criticise those who frown at my “daring” to mention “Igbo” when everyone ought to be preaching national unity. But they should not attempt to deny me my own right to freedom of expression. Is it fair if I don’t show interest in the affairs of the zone I come from? Meanwhile, I’ve not spared Igbo people that have contributed to the nation’s problems. I’m only asking that the Igbo who are honest and competent should be recognised for what they are. They should be treated like other Nigerians. Ndigbo’s ingenuity and hard work should be a source of strength for the nation; it should not attract envy or jealousy. The generation that fought a civil war (to defend themselves) 52 years ago is dying off. Most promoters of MASSOB and IPOB today had not been born then. As I once wrote, it is most regrettable that the “Asian Tigers” like Malaysia, Singapore and the Koreas have overtaken a people that, almost 50 years ago, made ogbunigwe bombs and rocket launchers, made trucks and tanks from scrap, refined fuel at their kitchens, built airstrips overnight and achieved other incredible feats. One Abdullah, in a rejoinder to my column, taunted me by asking why, if the Igbo were so enterprising, they hadn’t turned their native homeland to a mini Taiwan or at least a “Nigerian tiger”. In response, I told him he was ignorant, and that I didn’t think he had ever travelled more than 20km from the place he was born. Had he ever visited Nnewi, Aba or Onitsha or seen the technological wonders the Igbo “boys” are performing in Lagos and several major cities around the world, his opinion would have changed. As far back as the 1980s, Nnewi was viewed as Nigeria’s Silicon Valley because of the numerous industries that were in operation there. And Abdullah’s shoes supposedly “made in Italy” were actually made in Aba. The bad policies of incompetent governments have frustrated many industrialists, the Igbo not excluded. Nigeria has been the loser. Great thinking. The truth in this is slobbering but do people care anymore what future awaits their country Nigeria? I think the concern of people is to make maximum profit today and get done with the idea of one nation. If you don’t share that position you are treated as a pariah and a wailer, even an enemy. As Ndigbo two things are necessary and urgent. Let those who manage the allocations to the states stop competing with others on how to waste and steal public funds and if possible let the states pool resources to execute projects of consequence. Igbo Renaissance is not impossible but it is a tall order.